According to the National Institute on Drug Abuse, inpatient treatment is one of the most effective ways to treat opiate abuse. In order to find the best inpatient treatment center, you need to consider all of the information about treatment centers. You need to look at who needs inpatient treatment and what basic services they offer. users who are in unstable homes – users whose home environment is not stable or is contributing to their use. This could be because of other users in the home or because the home is particularly volatile. users who are homeless – sometimes heavy drug use leads to homelessness. Those who are homeless and seeking treatment often need inpatient treatment. users whose home is violent – many victims of abuse become addicts to deal with the abuse. users who suffer from a physical illness – some physical illnesses make withdrawal and treatment difficult or dangerous. When this is the case, the user needs to be more closely monitored in a medical setting. users who suffer from a mental illness – certain mental illnesses need to be treated along with the addiction. When this is the case, the user needs to be closely monitored. users who relapse frequently – when you try other methods and fail, inpatient treatment might work where others have failed. users whose addiction makes them dangerous to themselves or others – these users might be committed by a court order or arrest. users who have a high stress life – the stress often makes quitting the drug more difficult. users who have another addiction – multiple addictions are much harder to detox from and many times requires medical assistance. Inpatient treatment is very valuable all cases, but these cases need inpatient treatment to prevent some of the issues that are a part of opiate detox. Although it is not difficult to find an inpatient treatment center, it can be difficult to find the best inpatient treatment center for you. In order to be successful at rehabilitation, you need to find a treatment center that matches your needs. Different inpatient centers offer different services. The level of these services vary depending on the addiction level and the center itself. Most inpatient centers offer a variety of services. Buprenorphine is often used to treat opiate withdrawal. Methadone – a popular replacement drug that is also used to treat chronic pain in people who are addicted to opiates. It acts as a replacement for more addictive and more dangerous opiates. Buprenorphine – more mild than methadone, this drug still replaces opiates but is less addictive and has less side effects than Methadone. Suboxone – a combination medication that contains Buprenorphine and Naloxone. 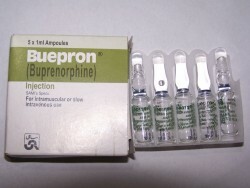 The buprenorphine acts as an opiate agonist and a painkiller while the Naloxone stops addiction. This is only slightly addictive and carries a very low risk of overdose. There are other brand names to these medications but they are all usually a combination of these. Medication replacement is usually only an option in inpatient treatment or very closely monitored outpatient treatment. medications to treat the other symptoms as they come up. These are usually short-term solutions for the withdrawal symptoms. Since the symptoms only usually last about two weeks, it is relatively easy to medicate them as they come up. Some inpatient rehab facilities practice a cold turkey method of detox. This means that you go through the detox without any medications to assist you. This is the preferred method of detox if you want to be completely clean while in rehab. During this, you will receive counseling and other forms of treatment. Many people who have experienced relapse multiple times choose this method. address the cause of the addiction. There are many aspects of addiction that have psychological roots. These roots need to be addressed before you can move on from the addiction. The holistic therapies are usually combined with more traditional methods of treatment. When trying to find the best possible inpatient option for opiate withdrawal it is important to consider all of the types of treatments. The best treatment option is the one that works best for you and your circumstances. For more information on inpatient treatment, options give us a call at 800-429-5210.